Click the photos to view each of the wine-themed sun catchers up-close. Description: Perfect for wine lovers and wine themed décor, this hanging leaded stained glass wine bottle measures 7.5 inches high x 4 inches wide. It has a glass cork on the top and green grapes drape down the side of the green bottle. The word "wine" is written with wire on the label. This sun catcher is also available in amethyst with amethyst and green grapes. Each color is available with either the word "wine" or "vino". All of these items can be found in separate listings. 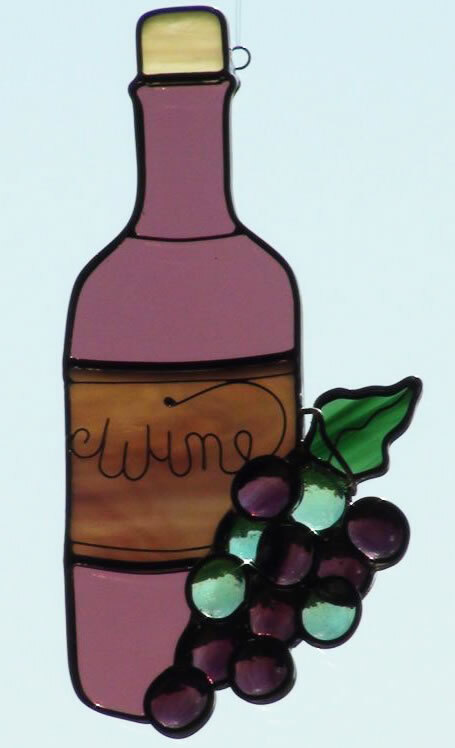 Description: Perfect for wine lovers and wine themed décor, this hanging leaded stained glass wine bottle measures 7.5 inches high x 4 inches wide. It has a glass cork on the top with amethyst & green grapes draping down the side of the amethyst bottle. The word "wine" is written with wire on the label. 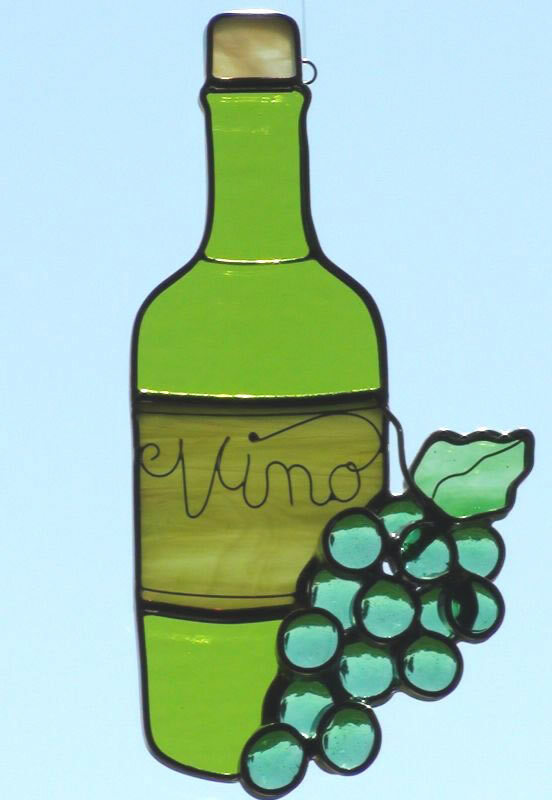 This sun catcher is also available in green with green grapes. Each color is available with either the word "vino" or "wine". All of these items can be found in separate listings. 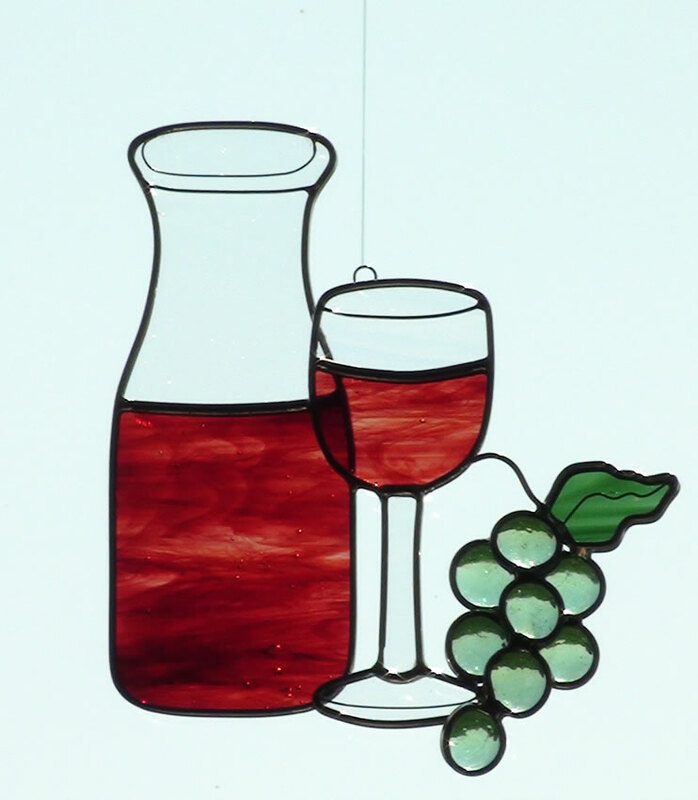 Description: Perfect for wine lovers and wine themed décor, this hanging leaded stained glass wine bottle measures 7.5 inches high x 4 inches wide. It has a glass cork on the top and green grapes drape down the side of the green bottle. The word “vino” is written with wire on the label. This sun catcher is also available in amethyst with amethyst and green grapes. Each color is available with either the word “wine” or “vino”. All of these items can be found in separate listings. 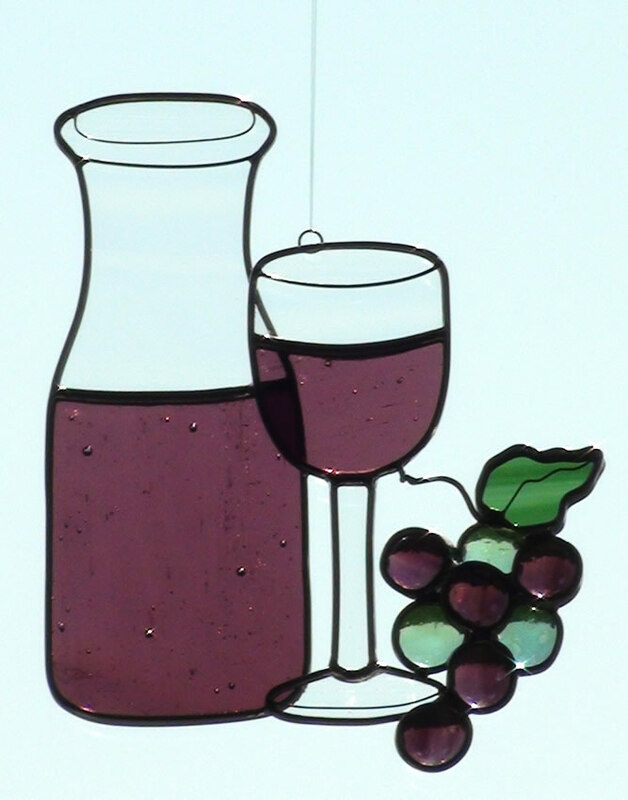 Description: Perfect for wine lovers and wine themed décor, this hanging leaded stained glass wine bottle measures 7.5 inches high x 4 inches wide. It has a glass cork on the top and amethyst and green grapes drape down the side of the amethyst bottle. The word “vino” is written with wire on the label. 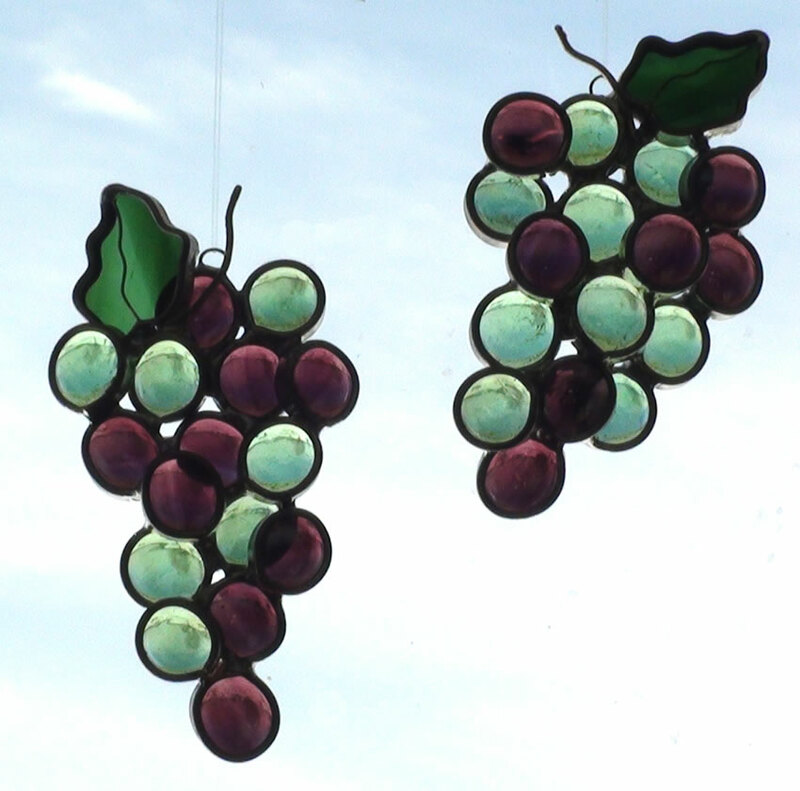 This sun catcher is also available in green with green grapes. Each color is available with either the word “wine” or “vino”. All of these items can be found in separate listings. 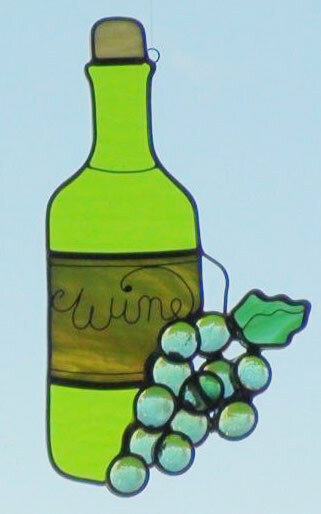 Description: This unique hanging leaded stained glass piece is perfect for wine lovers or any wine themed décor. The 5 inch x 7 inch wine carafe and glass are cut from clear glass with a subtle random swirl and each are half filled with amethyst wine. Green and amethyst grapes lay across the bottom of the glass. A perfect companion piece is the stand up Carafe and Glass in a matching color with a votive candle. These items are also available in burgundy with green grapes and can be found in separate listings. 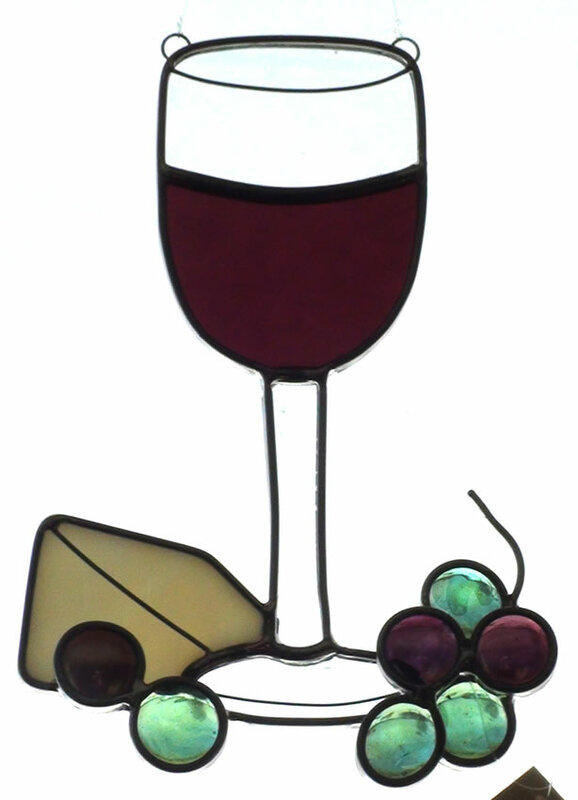 Description: This unique hanging leaded stained glass piece is perfect for wine lovers or any wine themed décor. The 5 inch x 7 inch wine carafe and glass are cut from clear glass with a subtle random swirl and each are half filled with burgundy wine. Green grapes lay across the bottom of the glass. A perfect companion piece is the stand up Carafe and glass in a matching color with a votive candle. These items are also available in amethyst and can be found in separate listings. 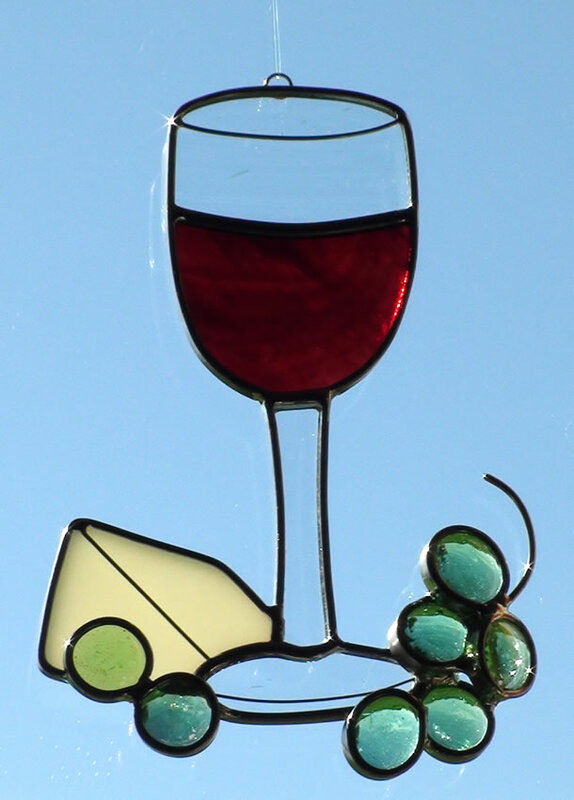 Description: This 4 inch x 6 inch hanging leaded stained glass wine themed sun catcher focuses on a wine glass surrounded by grapes and a wedge of cheese. The glass is half full of amethyst colored wine and the grapes are randomly colored amethyst and green. Perfect for wine lovers and wine themed décor. Companion pieces to create a wine themed ensemble can be found in other listings including Candle Holders. This sun catcher and matching candle is also available in burgundy. 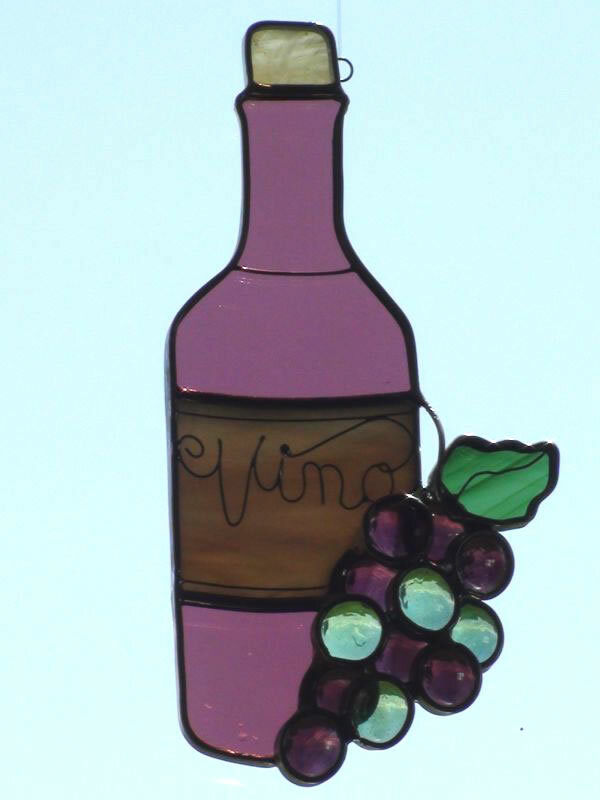 Description: This 4 inch x 6 inch hanging leaded stained glass wine themed sun catcher focuses on a wine glass surrounded by grapes and a wedge of cheese. The glass is half full of burgundy colored wine and surrounded by green grapes. Perfect for wine lovers and wine themed décor. Companion pieces to create a wine themed ensemble can be found in other listings. This sun catcher is also available in amethyst. Description: Constructed from rounded glass nuggets every bunch of grapes is unique. Each nugget is randomly placed according to it's shape and size like real grapes in nature. A cut glass leaf and wire stem is attached to each amethyst and green bunch. Each sun catcher is sold as one bunch of grapes. The picture depicts the random placing of two bunches. One bunch of grapes measures approximately 3 inches by 5 inches.